In the “hard takeoff” scenario, a psychopathic AI suddenly emerges at a superhuman level, achieving universal dominance. Hall suggests an alternative: we’ve gotten better because we’ve become smarter, so AIs will evolve “unselfish genes” and hyperhuman morality. More honest, capable of deeper understanding, and free of our animal heritage and blindnesses, the children of our minds will grow better and wiser than us, and we will have a new friend and guide–if we work hard to earn the privilege of associating with them. 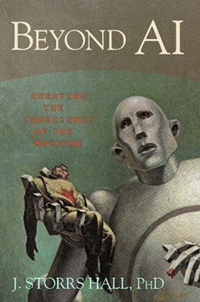 Originally published in Beyond AI: Creating the Conscience of the Machine, Ch. 20. Reprinted with permission on KurzweilAI.net May 31, 2007. To you, a robot is a robot. Gears and metal. Electricity and positrons. Mind and iron! Human-made! If necessary, human-destroyed. But you haven’t worked with them, so you don’t know them. They’re a cleaner, better breed than we are. Over the past decade, the concept of a technological singularity has become better understood. The basic idea is that the process of creating AI and other technological change will be accelerated by AI itself, so that sometime in the coming century the pace of change will become so rapid that we mere mortals won’t be able to keep up, much less control it. British statistician and colleague of Turing I. J. Good wrote in 1965, “Let an ultraintelligent machine be defined as a machine that can far surpass all the intellectual activities of any man however clever. Since the design of machines is one of these intellectual activities, an ultraintelligent machine could design even better machines; there would then unquestionably be an ‘intelligence explosion,’ and the intelligence of man would be left far behind.” The disparate intellectual threads, including the word “singularity” from which the modern concept is woven, were pulled together by Vernor Vinge in 1993. More recently it was the subject of a best-selling book by Ray Kurzweil. There is even a reasonably well-funded think tank, the Singularity Institute for Artificial Intelligence (SIAI), whose sole concern is singularity issues. Prudence, indeed, will dictate that superhuman psychopaths should not be built; however, it seems almost certain someone will do it anyway, probably within the next two decades. Most existing AI research is completely pragmatic, without any reference to moral structures in cognitive architectures. That is to be expected: just getting the darn thing to be intelligent is as hard a problem as we can handle now, and there is time enough to worry about the brakes after the engine is working. As I noted before, much of the most advanced research is sponsored by the military or corporations. In the military, the notion of an autonomous machine being able to question its orders on moral grounds is anathema. In corporate industry, the top goal seems likely to be the financial benefit of the company. Thus, the current probable sources of AI will not adhere to a universally adopted philanthropic formulation, such as Asimov’s Three Laws. The reasonable assumption then is that a wide variety of AIs with differing goal structures will appear in the coming decades. A subtext of the singularitarian concern is there may be the possibility of a sudden emergence of (a psychopathic) AI at a superhuman level, due to a positive feedback in its autogenous capabilities. This scenario is sometimes referred to as a “hard takeoff.” In its more extreme versions, the concept is that a hyperhuman AI could appear virtually overnight and be so powerful as to achieve universal dominance. Although the scenario usually involves an AI rapidly improving itself, it might also happen by virtue of a longer process kept secret until sprung on the world, as in the movie Colossus: The Forbin Project. The first thing that either version of the scenario requires is the existence of computer hardware capable of running the hyperhuman AI. By my best estimate, hardware for running a diahuman AI currently exists, but is represented by the top ten or so supercomputers in the world. These are multimillion-dollar installations, and the dollars were not spent to do AI experiments. And even if someone were to pay to dedicate, say, an IBM blue gene or Google’s fabled grid of stock PCs to running an AI full-time, they would only approximate a normal human intelligence. There would have to be a major project to build the hardware of a seriously epihuman, much less hyperhuman, AI with current computing technology. Second, even if the hardware were available, the software is not. The fears of a hard takeoff are based on the notion that an early superintelligence would be able to write smarter software faster for the next AI, and so on. It does seem likely that a properly structured AI could be a better programmer than a human of otherwise comparable cognitive abilities, but remember that as of today, automatic programming remains one of the most poorly developed of the AI subfields. Any reasonable extrapolation of current practice predicts that early human-level AIs will be secretaries and truck drivers, not computer science researchers or even programmers. Even when a diahuman AI computer scientist is achieved, it will simply add one more scientist to the existing field, which is already bending its efforts toward improving AI. That won’t speed things up much. Only when the total AI devoting its efforts to the project begins to rival the intellectual resources of the existing human AI community—in other words, being already epihuman—will there be a really perceptible acceleration. We are more likely to see an acceleration from a more prosaic source first: once AI is widely perceived as having had a breakthrough, it will attract more funding and human talent. Third, intelligence does not spring fully formed like Athena from the forehead of Zeus. Even we humans, with the built-in processing power of a supercomputer at our disposal, take years to mature. Again, once mature, a human requires about a decade to become really expert in any given field, including AI programming. More to the point, it takes the scientific community some extended period to develop a theory, then the engineering community some more time to put it into practice. Even if we had a complete and valid theory of mind, which we do not, putting it into software would take years; and the early versions would be incomplete and full of bugs. Human developers will need years of experience with early AIs before they get it right. Even then they will have systems that are the equivalent of slow, inexperienced humans. There are two wild-card possibilities to consider. First, rogue AIs could be developed using botnets, groups of hijacked PCs communicating via the Internet. These are available today from unscrupulous hackers and are widely used for sending spam and conducting Ddos attacks on Web sites. A best estimate of the total processing power on the Internet runs to 10,000 Moravec HEPP or 10 Kurzweil HEPP, although it is unlikely that any single coordinated botnet could collect even a fraction of 1 percent of that at any given time. Moreover, the extreme forms of parallelism needed to use this form of computing, along with the communication latency involved, will tend to push the reasonable estimates toward the Kurzweil level (which is based on the human brain with its high-parallelism, slow-cycle time architecture). That, together with the progress of the increasingly sophisticated Internet security community, will make the development of AI software much harder in this mode than in a standard research setting. The “researchers” would have to worry about fighting for their computing resources as well as figuring out how to make the AI work—and the AI, to be able to extend their work, would have to do the same. Thus, while we can expect botnet AIs in the long run, they are unlikely to be first. The second wild-card possibility is that Marvin Minsky is right. Almost every business and academic computing facility offers at least a Minsky HEPP. If an AI researcher found a simple, universal learning algorithm that allowed strong positive feedback into such a highly optimized form, it would find ample processing power available. And this could be completely aboveboard—a Minsky HEPP costs much less than a person is worth, economically. Let me, somewhat presumptuously, attempt to explain Minsky’s intuition by an analogy: a bird is our natural example of the possibility of heavier-than-air flight. Birds are immensely complex: muscles, bones, feathers, nervous systems. But we can build working airplanes with tremendously fewer moving parts. Similarly, the brain can be greatly simplified, still leaving an engine capable of general conscious thought. My own intuition is that Minsky is closer to being right than is generally recognized in the AI community, but computationally expensive heuristic search will turn out to be an unavoidable element of adaptability and autogeny. This problem will extend to any AI capable of the runaway feedback loop that singularitarians fear. It is therefore most likely that a full decade will elapse between the appearance of the first genuinely general, autogenous AIs and the time they become significantly more capable than humans. This will indeed be a crucial period in history, but no one person, group, or even school of thought will control it. The question instead is, what can be done to influence the process to put the AIs on the road to being a stable community of moral agents? A possible path is shown in Robert Axelrod’s experiments and in the original biological evolution of our own morality. In a world of autonomous agents who can recognize each other, cooperators can prosper and ultimately form an evolutionarily stable strategy. There is but one good, namely, knowledge; and but one evil, namely ignorance. In a wealthy country, natural resources such as farmland are worth more but only by a small amount, mostly because they can be more efficiently used. The fraction of total wealth contributed by natural resources in a wealthy country is only 2 percent, as compared to 26 percent in a poor one. The vast majority of the wealth in high-income countries is intangible: it is further broken down by the report to show that roughly half of it represents people’s education and skills, and the other half the value of the institutions—in other words, the opportunities the society gives its citizens to turn efforts into value. For these reasons, individual AIs are likely to be able to have the equivalent of both memories and personal experience stretching back in time before they were “born,” as experienced by many other AIs. To the extent that morality is indeed a summary encoding of lessons learned the hard way by our forebears, AIs could have a more direct line to it. The superego mechanisms by which personal morality trumps common sense should be less necessary, because the horizon effect for which it’s a heuristic will recede with wider experience and deeper understanding. For example, AIs could well be designed without the mechanism we seem to have whereby authority can short-circuit morality, as in the Milgram experiments. * This is the equipment that implements the distributed function of the pecking order. The pecking order had a clear, valuable function in a natural environment where the Malthusian dynamic held sway: in hard times, instead of all dying because evenly divided resources were insufficient, the haves survived and the have-nots were sacrificed. In order to implement such a stringent function without physical conflict that would defeat its purpose, some very strong internal motivations are tied to perceptions of status, prestige, and personal dominance. *In 1963 psychologist Stanley Milgram did some famous experiments to test the limits of people’s consciences when under the influence of an authority figure. The shocking results were that ordinary people will inflict torture on others simply because they were told to do so by a scientist in a lab coat. The economic law of comparative advantage states that cooperation between individuals of differing capabilities remains mutually beneficial. Suppose you are highly skilled and can make eight widgets per hour or four of the more complicated doohickies. Your neighbor Joe does everything the hard way and can make one widget or one doohicky in an hour. You work an eight-hour day and produce sixty-four widgets, and Joe makes eight doohickies. Then you trade him twelve widgets for the eight doohickies. You get fifty-two widgets and eight doohickies total, which would have taken you an extra half an hour in total to make yourself; and he gets twelve widgets, which he would have taken four extra hours to make! And behold joy and gladness, … eating flesh, and drinking wine: let us eat and drink; for to morrow we shall die. Epihuman, much less hyperhuman AIs will be able to read and absorb the full corpus of writings in moral philosophy, especially the substantial recent work in evolutionary ethics, and understand it better than we do. They could study game theory—consider how much we have learned in just fifty years! They could study history and economics. Thirst for revenge, for example, is a way of guaranteeing any potential wrongdoers that you will make any sacrifice to get them back, even though it may cost you much and gain you nothing to do so. Here, the point of choice is after the wrong has been done—you are faced with an arduous, expensive, and quite likely dangerous pursuit and attack on the offender; rationally, you are better off forgetting it in many cases. In the lawless environment of evolution, however, a marauder who knew his potential victims were implacable revenge seekers would be deterred. But if there is a police force this is not as necessary, and the emotion to get revenge at any cost can be counterproductive. So collective arrangements like police forces are a significantly better solution. There are many such cases where strong emotions are evolution’s solution to a problem, but we have found better ones. AIs could do better yet in some cases: the solutions to Newcomb’s Problem involving Open Source–like guarantees of behavior are a case in point. Reflecting on these questions, I have come to a conclusion which, however implausible it may seem on first encounter, I hope to leave the reader convinced: not only could an android be responsible and culpable, but only an android could be. One of the defining characteristics of the human mind has been the evolutionary arms race between the ability to deceive and the ability to penetrate subterfuge. It is all too easy to imagine this happening with AIs (as it has with governments—think of the elaborate spying and counterspying during the cold war). On the other hand, many of the other moral advantages listed above, including Open-Source honesty and longer and deeper memories could well mean that mutual honesty societies might be a substantially winning strategy. How can we know that our AIs will retain the good qualities we give them once they have improved themselves beyond recognition in the far future? Our best bet is a concept from math called an invariant—a property of something that remains the same even when the thing itself changes. We need to understand what desirable traits are likely to be invariant across the process of radical self-improvement, and start with those. We humans have the strong intuition that mentalistic properties we impute to one another, such as the two above, are essential ingredients in whatever it is that makes us moral agents—beings who have real obligations and rights, who can be held responsible for their actions. Moral agency breaks down into two parts—rights and responsibility—but they are not coextensive. Consider babies: we accord them rights but not responsibilities. Robots are likely to start on the other side of that inequality, having responsibilities but not rights, but, like babies, as they grow toward (and beyond) full human capacity, they will aspire to both. The early religious traditions—including Greek and Norse as well as Judeo-Christian ones—tended to portray their gods as anthropomorphic and slightly superhuman. In the Christian tradition, at least, two thousand years of theological writings have served to stretch this into an incoherent picture. Presumably in search of formal proofs of his existence, God has been depicted as eternal, causeless, omniscient, and infallible—in a word, perfect. But why should such a perfect being produce such obviously imperfect creatures? Why should we bother doing His will if He could do it so much more easily and precisely? All our struggles would only be make-work. If our moral instinct is indeed like that for language, we should note computer-language understanding has been one of the hardest problems in AI, with a fifty-year history of slow, frustrating progress. So far AI has concentrated on competence in existing natural languages; but a major part of the human linguistic ability is the creation of language, both as jargon extending existing language and as formation of creoles—new languages—when people come together without a common one. My interpretation is that this must be a module. Nobody was thinking consciously, “There’s a picture of some eyes here, I’d better be honest.” We have an honesty module, but it seems to be switched on and off by some fairly simple—and none too creditable—heuristics.